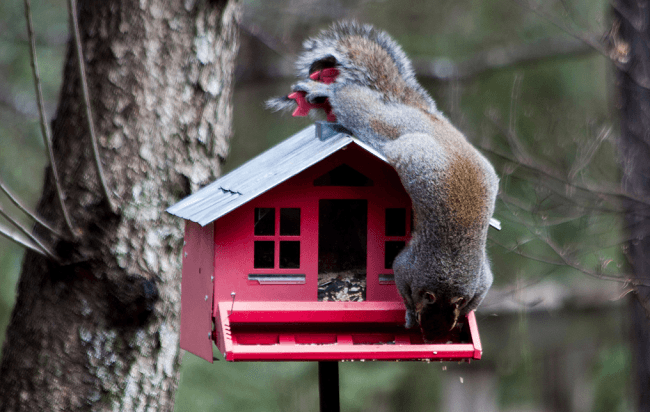 Are squirrels gobbling up all your birds’ meals? There are many ways to deter these clever little animals. If you are not into creating a separate feeder for your furry friends, then a squirrel proof caged bird feeder is a solid alternative. In the last few years, innovative and creative designs in squirrel proof bird feeders have immerged on the market. Some are truly unique in tackling an ongoing problem with greedy squirrels. In an effort to combat this problem some people are experiencing with seed thieves (while others rejoice at the entertainment), bird feeders can only get better. But remember, squirrels are witty problem solvers who delight in the challenge. Let’s take a look at some of the best designs consumers are choosing for squirrel proof caged bird feeders. These are our three favorites. Audubon Squirrel Proof ABS plastic mixed seed wild bird feeder comes with four convenient seed ports. This cage is made of a metal grid wiring which effectively will keep an adult squirrel from dining-in. This specific feeder will hold up to one quart of seed. Because it is completely encased in a powder-coated steel cage, squirrels will not be able to nibble but neither can large birds like blue jays, mourning doves or grackles. 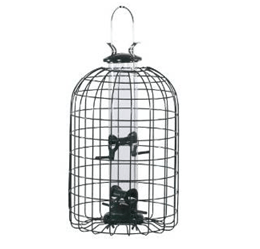 If you are trying to attract song birds, then this is the perfect caged tube-type bird feeder to own. The finish is complete in a natural forest green color and hold up to 1.25 lbs. of mixed seed. You can complete your backyard bird paradise via Amazon. After researching this specific brand, Amazon appears to be the only retailer who offers a lower price, and even some better deals on the Audubon Brand. Another consumer favorite is Birdscapes the Preserve Feeder which is an attractive yet functional squirrel deterrent bird feeder. It features a decorative metal top, numerous feeding ports and perches. This feeder will hold up to 3 lbs. of seed. The patented, diamond-shaped barrier allows birds’ access to food but keeps the squirrels guessing. The clear, shatter-proof plastic reservoir is designed to monitor seed levels. Due to some seeds which will mold, it is advised to clean your feeder once every two weeks with mild soap and water solution. Consumers love the Perky-Pet Brand when it comes to Wild Bird Feeders. This is not surprising as they truly are aware of what works and what doesn’t. They will always keep working on innovative designs for backyard enthusiasts. They are the leading supplier of Wild Bird Feeders and Accessories. We found this particular Perky Pet Birdscapes feeder at Amazon. Sticking with The Perky-Pet Brand, this is the number one favorite and newest design by them. 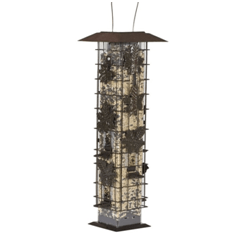 Squirrel-Be-Gone Wild Bird Feeder features six feeding ports, and U-shaped perches. The interior tower will hold 3.4 lbs. of seed, and is surrounded by rustic metalwork. The little feeding perches are designed to support the weight of birds, but when a squirrel attempts to perch on them, their heavier weight will cause the entire metal casing to slip down and completely block the feeding ports, denying them access to the seed. This is some serious new anti-squirrel technology! The Squirrel-Be-Gone Wild Bird Feeder will attract a huge variety of different types of feathered friends. Count on seeing cardinals, finches, jays, kinglets, flickers, and even woodpeckers. Perky Pet completely scored on this design. 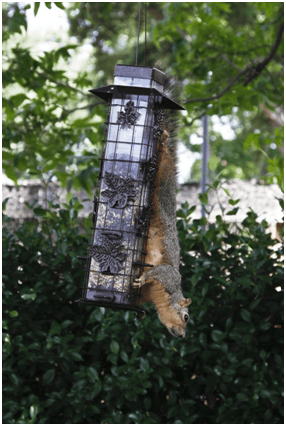 You will receive this innovative Squirrel-Be-Gone wild bird feeder fully assembled. Amazon has the best price for it at only $19.99, with some discounted deals available as well. This cool Perky Pet bird feeder holds up to 2 pounds of black oil sunflower seed, peanuts, or mixed seed. Squirrels love peanuts and sunflower seeds, so they are bound to try to figure out how to access this meal. Instead of watching the struggle, as entertaining as it will be, consider adding a platform feeder across your yard dedicated to the squirrels. You will not only be amused by their behavior, but because they are territorial, they will not be interested in your bird feeders, plus they will keep new squirrels away. Problem solved. Unless of course, this is not an option in your environment, then no worries, you can still depend on any of these three listed squirrel proof caged bird feeders to help keep those sly bandits from your bird’s buffet.